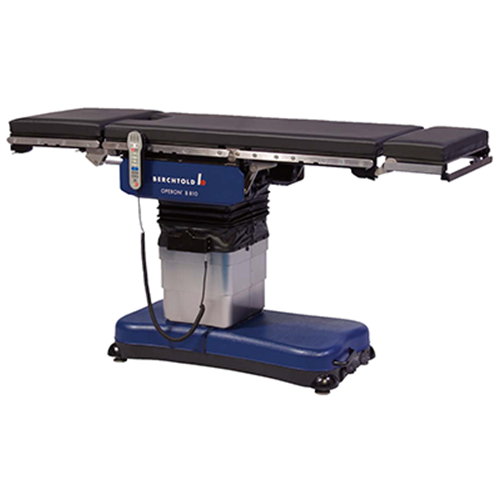 Designed for use in surgical suites where control and patient positioning are critical, the Stryker Berchtold Operon B810 is a feature-rich, remote control table that enhances patient positioning and provides complete support throughout its entire range of motion. The 305 mm (12”) longitudinal slide, carbon fiber table top and integrated x-ray cassette channel all contribute to the superior imaging characteristics of the B 810. The B 810 will lift and articulate a patient weight capacity of 275 kg (600 lbs) both in normal and reverse orientation, setting the industry standard for simplicity and ease of use without sacrifice of features. Width 21 inches (533 mm); excluding the side rails. Ambient temperature range of 50 to 100° F (10 to 38° C), relative humidity range of 10% to 95%, at altitudes from sea level to 8000 ft.
relative humidity range of 0% to 95% at altitudes from sea level to 50,000 ft. Section, which may be up to 30° in the Trendelenburg position.